Why can’t “keep the change” send it to a charity instead? Keep the Change is a Bank of America program that takes a debit card purchase, rounds it up to the nearest whole dollar and deposits the difference in the consumer’s saving account. Moving some spare change to your savings account every day probably isn’t going to guarantee a comfortable retirement, and so the program may not seem all that appealing to people. “I don’t use the program now because the incremental savings isn’t great enough to change my behavior,” writes reader Kate Barasz. How can Bank of America get customers like Kate to participate? More than a few readers with similar thoughts have written in to ask: Why can’t Bank of America offer the option to send this spare change to a charity of the consumer’s choice instead? That would increase its popularity, readers say. Of course, sending the money, even in these small amounts, would move it out of the bank’s capital base. Given how pitiful interest rates are these days on savings accounts and how conservative lending standards have become, every penny that stays in house is likely to make banks a nice return. Bottom line: Good idea; don’t look for it anytime soon. Fed to banks: “Overdraft protection” isn’t a customer favorite. Change the default rule. The Federal Reserve will prohibit banks from charging overdraft fees on automated teller machines or debit cards, unless a customer has agreed to pay extra charges for exceeding account balances. Financial companies will have to explain overdraft programs and fees, as well as choices available to consumers, the Fed said today in a statement announcing a rule that takes effect next year. The rule comes after Fed research indicated that consumers don’t like to be automatically enrolled in overdraft protection programs. Of course, most consumers don’t even know they’ve been enrolled until they get hit with a fee after overdrawing their accounts. More at Bloomberg. Addendum: The new default rule won’t apply to old fashioned checks or regularly recurring debits from checking accounts. As more and more people pay their cable, phone, and utility bills automatically and electronically, a new round of debate about the default rule may still be ahead. 1) The Justice department says it can save $573,000 through fiscal year 2010 by switching to double-sided printing. 2) Google’s Chrome browser saves ink by defaulting to extra wide margins. Hat tip: Wayne Smith. 4) Stephen Hentrich reads at night. To limit his reading, he set up a switch to disconnect his bedside lamp from the power supply. The lamp reconnects a half hour later just in case he needs to find his way to the bathroom. 5) Chris Peterson wants an online bank account that takes the many “mental accounts” he has in his head for food, rent, iPod stuff, etc. and put them onto his banking homepage. The single checking account look just isn’t doing it for him. Reader David Campbell sends along a fascinating story about human habits and attention. Safe to say, no econ would make this mistake. Several years ago, Campbell consulted on a highway widening project in Atlanta. To make room for the new lanes, a bank branch had to be demolished. Approximately 90 days prior to the demolition of the branch location, all the customers who banked at that location were notified in writing as to what would be occurring and were advised as to the location of a nearby branch that would be handling their accounts. Several large notices were also posted at the branch containing the same information. Follow-up written notices were also sent to the customers 60 days and 30 days prior to the closing. All the branch officers and tellers were constantly reminding people of the upcoming event. Finally the day of closing arrived. The last customer left the bank, the doors were locked and a large sign at the entrance to the parking lot clearly stated that fact. The next day the wrecking crew moved in and began the demolition. Case Closed? WRONG! Apparently, about ten days after the bank was demolished and all the bank signs and other identification had been removed from the site, the bank started receiving a trickle of calls from its customers complaining that something was wrong with their accounts. As time moved on the situation worsened, but it wasn’t until someone actually went out to the site that now contained a non-existent building was the problem solved. The only thing that remained on the site was the bank vault. The vault had been duly cleaned out at the time of closing, but the structure itself could not be removed by conventional means and required that it be jack hammered apart. The rear wall of the vault also housed the drop box for the night depository. Although the depository was checked and cleaned out at the time of closing, it never occurred to anyone to seal the depository slot. For approximately 45 days the carefully trained employees of nearby businesses had been doing as instructed and were dropping the day’s cash receipts into the night depository. The building was gone. The bank signs were gone. Most of the parking lot was gone. The sidewalks and drive-thru lines were gone. To make a deposit required that a person park his car and walk about 30 feet over a dirt path. When the bank official opened the night depository box, he found over $250,000 in cash. 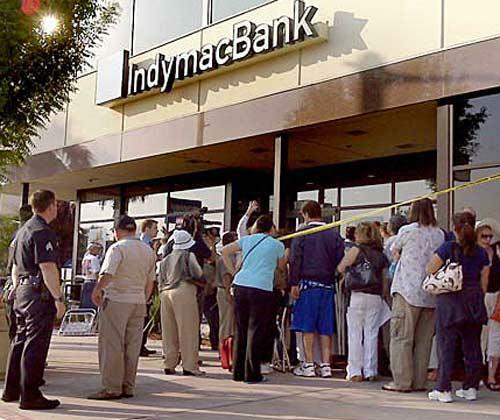 Fortunately it never occurred to the local bank robbers that people could be that dumb. The bank vault door had been removed in the demolition as had all the bank security systems, and the night depository inside the vault could be opened with a crow bar. Campbell asks fellow Nudge readers: Can anyone top this story?